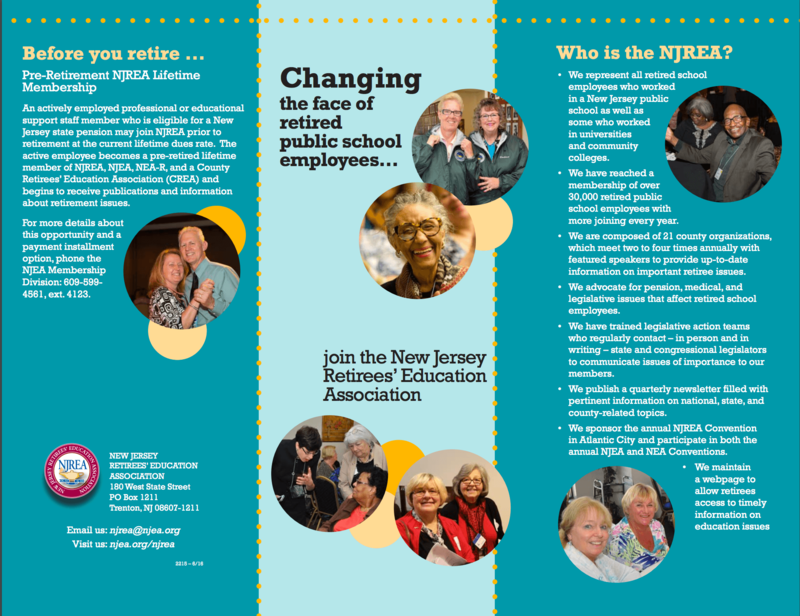 Join the group that is changing the face of retired public school employees…the New Jersey Retirees’ Education Association. We represent all retired school employees who worked in a New Jersey public school as well as some who worked in universities and community colleges. We have a membership of nearly 28,000 retired public school employees with more joining every year. We are composed of 21 county organizations, which meet two to four times annually with featured speakers to provide up-to-date information on important retiree issues. We advocate for pension, medical, and legislative issues that affect retired school employees. We have trained legislative action teams who regularly contact—in person and in writing—state and congressional legislators to communicate issues of importance to our members. We sponsor the annual NJREA Convention in Atlantic City and participate in both the annual NJEA and NEA Conventions. We publish a quarterly newsletter filled with pertinent information on national, state, and county-related topics. We maintain a webpage to allow retirees access to timely information on education issues. Membership in the largest retired educator organization in the nation as well as maintaining your membership in NJEA, NEA, NEA-Retired, and your County Retired EA. The NJREA Newsletter, a quarterly publication, in addition to continued receipt of the NJEA Reporter, NJEA Review, and all NEA publications. An annual NJREA membership runs each year from September 1 through August 31. Each May, members are mailed personalized statements which indicate individual annual dues cost. Membership dues are based on positions held during active employment and adjusted accordingly. Lifetime dues are optional and may be paid through an installment plan. In accordance with NJREA’s unification policy, membership in a county retired education association (CREA) is required. In most cases, retirees join the county organization that includes the district from which they retired. However, retirees are free to join the CREA where they live or may choose to belong to both. Members who become lifetime members of their CREA must become an NJREA lifetime members as well.